Drenching rains flooded out D.C.-area roadways, including parts of the Beltway Monday morning. Overall, more than 1 inch of rain fell by late Monday morning, pushing the region one step closer to the wettest year on record. WASHINGTON — Drenching rains flooded out D.C.-area roadways, including parts of the Beltway Monday. 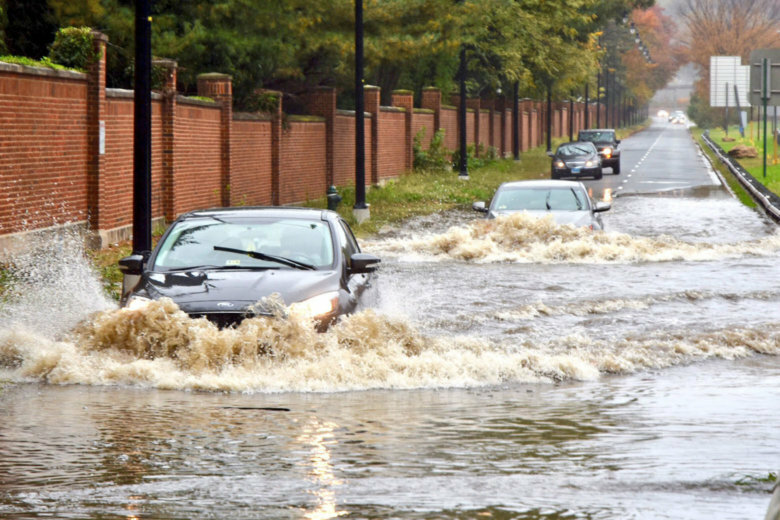 The heavy rains prompted flood warnings for the immediate D.C., including the District, parts of Montgomery and Prince’s County in Maryland and parts of Fairfax County, Falls Church and Alexandria in Northern Virginia until 3 p.m. The record wettest year on record for the D.C. area was 1889 when 61.33 inches of rain drenched the region. “So between now and the end of the year … we just need a little over 6 inches for the rest of the year to make a run at the record wettest year in the D.C. area,” Fling said. Across the region, the rain had mostly turned to drizzle by early afternoon. But the earlier downpours caused traffic headaches. Traffic was snarled Monday morning on parts of the Beltway after the heavy rain — and leaf-clogged drains — led to high standing water on two lanes of the Beltway’s Inner Loop at River Road in Montgomery County. That snarl eventually led to traffic backing up across the American Legion Bridge back to Tysons, Virginia — a bottleneck that remained throughout the early afternoon. The WTOP Traffic Center was recording delays coming off the Dulles Toll Road and also off the George Washington Parkway. Callers in the area of the Beltway reporting high standing water said road crews had hauled in snow plows to unclog storm drains of fallen leaves. There were also a number of crashes on slick roads Monday morning. Other area roadways were also washed out by the rain. Overlook Avenue in Southwest D.C. near the Blue Plains wastewater treatment center was completely covered by water late Monday morning, even as drivers continued trying to plow through the water. Authorities advise drivers to never try to drive through standing water, and to instead turn around and find an alternate route. Be warning, there’s more rain in the forecast Tuesday. Scattered showers and thunderstorms are expected throughout the day. Montgomery Parks has also announced that all natural-surface trails in Montgomery County will be closed until Wednesday, Nov. 7 due to excessive flooding and muddy conditions. (WTOP’s Kristi King contributed to this report).